In this podcast, Manny Coats talks with PPC expert, Brian Johnson. How did Brian Johnson start in PPC? What are the changes in the Amazon algorithm? Brian and Manny talks about the introduction of the 5000 character back end update. How powerful are keywords in product title for product ranking? Does it matter if specific words are placed into search field one or five? How often should I test on my product to see what works? Manny and Brian talks about keywords. Should I do conservative or aggressive product campaigns? Where do auto campaigns for product heavily rely on? How am I affected if my product is in the wrong category? Manny and Brian talks about BidPlus. 01:27 MANNY: Today it is my pleasure to have an interview with BRIAN Johnson. He runs the Amazon Pay Per Click troubleshooting group on Facebook and he is just a wealth of information. BRIAN, how are you doing? 01:46 BRIAN: I am doing fantastic, thanks for having me. 02:20 MANNY: Tell us a little bit about yourself. 02:21 BRIAN: About Amazon – I started out three years ago. I did EBay 6 years prior to Amazon and a buddy of mine pulled me in. I started to help people who got referred to me, to set up their product lines on Amazon – something that I did for a year and a half. I was doing advertising, quality control and all that stuff. This time last year I started focusing on the advertising side of it, on sponsored products. 04:21 MANNY: Not only are you doing client work, but you’re still running your FBA business full-time? 02:27 BRIAN: As far as FBA work goes – I’m in supplementation which is a highly competitive niche – that one has its own set of challenges. I no longer do the end-to-end account management of Pay Per Click management on Amazon. I work with some associates that handle that side of things. Most of what I specialize in is the troubleshooting and experimentation and testing to figure out what’s working and what not. I also do consulting calls for sellers who reach out and ask for my assistance for probably a year now. 05:48 MANNY: If anybody knows their stuff on Pay Per Click, it’s you and that’s how I came to know you. You have the definitive place on Facebook to get Pay Per Click information. 06:07 BRIAN: I was just starting out and there was a lot of groups out there but I decided to specialize in it. It was my fourth group – I started out other ones having to do with Amazon reviews and FBA troubleshooting and it was the PPC one that just seemed to take off. I think we have 3900 members now. 07:07 MANNY: Because you’re the PPC Guru, people are almost always tagging you in their questions. 07:17 BRIAN: Without a doubt. 07:58 MANNY: The number one question people who just started selling on Amazon ask, always related to Pay Per Click. In 2016 we’ve had three major algorithm changes with Pay Per Click? 08:19 BRIAN: Three major ones and four minor ones as soon as the beginning of January. 08:27 MANNY: What did you see? 08:28 BRIAN: For anybody who has worked with other platforms, they see algorithm updates and co changes and policy changes. Amazon really tries to introduce their own policy changes and they’re doing a lot of hiring out from other companies including Google. What occurred in January was mainly to reduce the effectiveness of targeting competitor brand names in your campaigns. They require a lot more relevance to match what the shopper was looking for. 10:01 MANNY: Is that something people can get in trouble for – if they use their competitor’s brand in the search terms on the back end? 10:08 BRIAN: Yes, technically. I would stay away from any new large brand names who have large legal teams who put pressure on companies like Amazon to help enforce their trademarks and brands – Nike, Disney etc. that was the first major change. The second major one was the beginning of February – the ground hog update – the rolled it out every two to four days. Initially there were a few people who asked what’s wrong with their exact word campaign. They split up the algorithms to affect the individual match types differently – exact match was hit right away. Some were hit with their phrase matches but broad matches were fine. 12, 13 days after they rolled it out, they started rolling it back. People had problems with their campaigns then – one day have 30 sales and the next nothing. At the end of February, it started to settle down – not everybody recovered to the levels they were before February but there was a new playing field. 15:24 MANNY: It seems like they’re rolling out something major every single month. 15:28 BRIAN: It’s their patch in 2016. They launched right away in January. Most people didn’t observe that but someone who see a lot of campaigns daily, notices that immediately. I get a lot of feedback from my clients and consultants I work with. 17:06 MANNY: One of the big changes for me that affected my revenue substantially was the 5K character back-end update. 17:13 BRIAN: Correct. The 1000-character field was available from last summer and in March they introduced the 5000 characters. 18:59 MANNY: When somebody has 400 characters in their bullet points and something happens where their characters is switched over and things don’t work, what can they test quickly to know whether they’re affected? 19:15 BRIAN: I haven’t seen any specific data to support that. I’d say if you fill out the 5 search fields and nothing occurs. Some categories are rolling out the 80-character title restriction too now. 21:20 MANNY: Are people noticing that they have to reduce their title length to 80 characters because they’re getting a quality alert or is they’re account getting flagged? 21:39 BRIAN: They try to make a change and save it and it throws back the change and say they can’t do that until they conform. 22:17 MANNY: Let’s say you’ve got a client account and they’ve got the 5k characters on the back-end, they want to change the title but it says that their bullet points are too long and need to reduce them down to 100 characters. The product is doing really well – would you suggest leaving it or saying the time is here, it’s time to shorten those bullets? 22:41 BRIAN: I’m very sensitive when it comes to title changes because they have such a heavy weight both organically and with sponsored products, it could make or break your sales. If you are already doing well, I would limit the changes until you have to. 24:19 MANNY: Are keywords in your title more powerful for ranking than your product itself? 24:29 BRIAN: I think so, but whether some people conform to the format Amazon wants as far as having the brand name right in front of the title, they seem to do better, everybody on page one has their brand name at the front. They may be in a category where the algorithm gives bonus to the category. I primarily focus on what’s included in that first 115 characters in a title. 25:26 MANNY: Let’s say you don’t use the brand in your title, but it says “sold by” and there’s a brand there, you can rank for that as well? 25:41 BRIAN: It should, I’ve never tested it. 25:51 MANNY: Let’s say that you have 500 characters and you add it. Do you eliminate all duplicates? 26:02 BRIAN: I go one step further – I have back-end software that I use that picks specific words based off of their value. Everything must be unique words and relevant to your product. 26:33 MANNY: Does it matter whether specific words are put into search field number one or five? 26:43 BRIAN: Technically, no. There is a certain way in which Amazon displays the keywords and we are starting to test whether Amazon is shifting their original way of displaying products to a searcher. I am predicting that they’re going to go more towards a phrase match. 28:28 MANNY: How long would you say they should wait once they make a change during the tests? 28:31 BRIAN: About a week. One of the things that I advise is – Amazon has a refresh period of about four days so if you make a major change, they want to see whether the change helps the customer experience or hurts it. 30:04 MANNY: If somebody raises a price on their product and it just doesn’t work out, and their search phrase loses position, what do you recommend for them to get that organic ranking back? 30:30 BRIAN: They can roll back to whatever changes they were before and see if it undoes. 30:42 MANNY: If it was only the price change that caused that, and they bring the price back, could they could drive it back through any other strategy that you’d recommend? 30:52 BRIAN: You can always use Pay Per Click in order to go after a specific goal. You won’t turn on Pay Per Click and affect your organic position to be on page one suddenly. It is just something that shows you sell more than your competitor and which outs you ahead of them additional to your organic sales so you can recover some of that. Most of us look at our organic using research tools that allows us to see how many units are sold by whoever is on page one, but that’s based off of a keyword, this does not give us any indication of units sold on Pay Per Click. 32:53 MANNY: If How often would you suggest someone continuously testing on a specific product? Is there too much testing? 32:59 BRIAN: You can do much testing at once, if you make too any changes you don’t know if something actually occurs, you don’t know which change you made and if more than one change cancels the other out. I would say to test on a weekly basis. Don’t do bullet points and title changes and back-end search terms at once. You won’t know which one did it. 35:07 MANNY: Earlier on we were talking about the search fields on the back-end and compound words, would it be in people’ best interest to instead of having ‘bunny’ in line one and ‘scratcher’ in line two, to put them together on the first search field? 35:35 BRIAN: We’re still in the experimental stage and 92% of our tests result in no benefit. Even if we find something that works well for 50% of the sellers, the other 50% didn’t get any benefit out of it. You can run tests; I would focus on testing if some of the known solutions such as filling out the 5 rows of search terms, work. 37:12 MANNY: What about repeating – should you be taking keywords that are in your title and bullet points and descriptions and placing those in the keyword fields? 37:27 BRIAN: Try to focus on one test at a time. Test it and see if it works or not, and then move forward. 37:57 MANNY: Are you finding that description keywords are now ranking a lot more than they use to? 38:03 BRIAN: Some people have reported throwing in a translated term and it’s coming up on their search terms, whether that impacts sales or not, I don’t know – I haven’t seen any direct correlation between the two. 39:07 MANNY: If I’m putting something in my description, it ranks. For other people this doesn’t work so I’m wondering if there’s a deeper algorithm that takes seller feedback into account. 39:35 BRIAN: Certainly on organic. That’s always been played into things like the Buy Box, it changes over time too. When we just started, there were 15 factors that influenced the organics. With the subtle changes Amazon has, they have a comparable price point to other sales channels – their concern about getting deliver products to customers quickly and to protect their pockets – if you take marketing services etc. away, we often see penalty, it’s not an uncommon observation to drop from one page to another. 42:14 MANNY: About strategies – conservative vs aggressive strategies? 42:24 BRIAN: Most of what I teach is conservative. With the training I do, I go more into the aggressive experiments and having multiple campaigns running. I’m passionate about people doing the validation campaign – the keywords or terms shoppers use prior to any sales- just to see what the playing field is in their niche product and bid ranges. The first thing I check is if Amazon understands what I’m selling and they’re going to show this by how they’re showing my ad impression to shoppers. 45:16 MANNY: The Pay Per Click from an automatic campaign – is that heavily based on all the keywords that you put into your product? 45:27 BRIAN: That used to be the case – driven by the title in the back-end search term as well as the category. Amazon has a lot more data than they’re showing and they can tell by your content what you’re selling so they give you relevant keywords of products that were bought, similar to yours and we’re going to show your ad if we think that you’re going to get clicks from the same audience we’ve seen work for the other sellers. 46:23 MANNY: If someone puts their product in the wrong category, they could create some problems for themselves then? 46:30 BRIAN: Yes, that’s a common check. Amazon will sometimes shift one product to another category and it hurts the organic or Pay Per Click. It usually takes a week to figure out if you’ve taken a hit on your organic or Pay Per Click. 47:34 MANNY: If Amazon does move you and you see a negative effect, can you request to get moved back? 47:40 BRIAN: Yes, absolutely – if you can make a case, you’ll get feedback from them. They’re trying to defend the system from misuse. 50:10 BRIAN: Yes, we more recently see contradictions against policy where a brand is running a sponsored ad in their title and repeat the word 7 for 8 times for months. 51:12 MANNY: If you see something like this and it hurts tour business, is their something you can do? 50:22 BRIAN: You can report it and it may not do anything but what’s bad about this is anytime you draw attention, you draw attention to yourself too. 53:08 MANNY: Any final experiments that you’re running that you want to talk about? 53:13 BRIAN: All testings I do is on the search room field to see which ones work. We have to repeat tests ten, 20 times to see how it performs elsewhere in all categories and a month later Amazon changes something and we start all over. I focus on what needs to go into the back-end search term fields and what is connected to it such as bullet points. 54:21 MANNY: How do people find out of the results then? 54:26 BRIAN: I keep some info personally. When I find results, I’m not afraid to post them and see what I see, to get feedback from different people. 55:50 MANNY: There’s always change, what worked a month ago will not work now. 57:48 BRIAN: The second biggest group experiment I’ve been running internally has to do with Amazon changing their ads to the right hand side – whether Amazon is putting more benefit to BidPlus. 59:07 MANNY: BidPlus isn’t available to everyone right? 59:11 BRIAN: It’s available through North-America, I’m not sure how much internationally, not in every category. 1:01:34 MANNY: How do the listeners reach out to you? 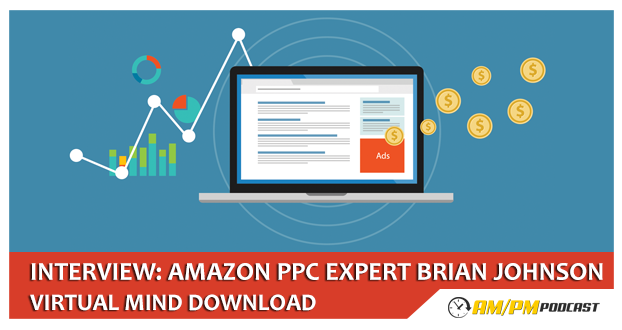 1:01:43 BRIAN: We have PPC software and the second version is launching in April, we also working on a PPC course launching in late April, but they can reach me on Facebook at the Amazon PPC Troubleshooting group. 1:02:52 MANNY: What’s the name of the software? Listen to the podcast to hear the full interview and to learn more.